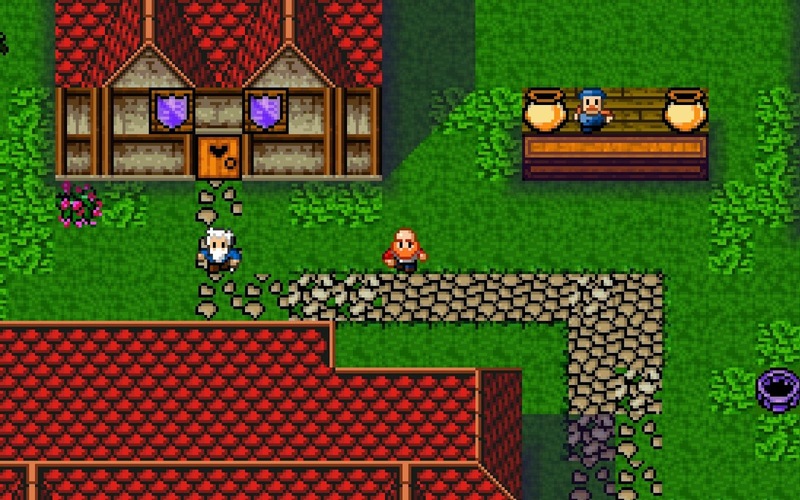 The first review of August on this first of August is a retro-inspired series of RPGs for both the Nintendo 3DS and Wii U eShops, Dragon Fantasy: The Volumes of Westeria. Does this retro wonder deliver a good game, or is it too mired in old school sensibilities? 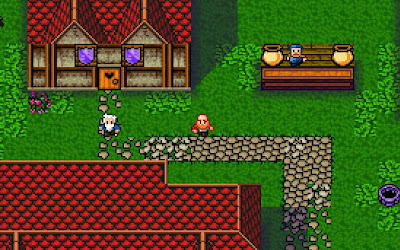 Originally released in 2011, Dragon Fantasy Book I was a retro Dragon Quest and Final Fantasy-inspired (hence the game's name) for iOS. Since its original launch, multiple books released for iOS and the PlayStation Vita. For the Nintendo 3DS release, all of the books have been combined to one package with Dragon Fantasy: The Volumes of Westeria. Not only this, but several issues from the separate book releases have been rectified in this combined launch. Dragon Fantasy: The Volumes of Westeria is devised of four unique books, each offering a different adventure for players to join. The first is the biggest of the bunch, following Ogden, a retired hero who returns to prominence once the Dark Knight attacks Westeria castle and terrorizes the royal family. 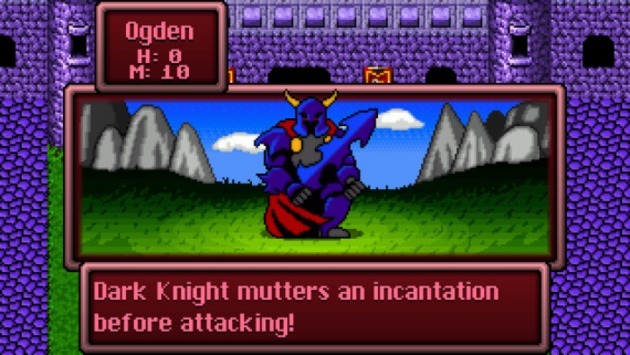 Ogden gets transported away from Westeria in the scuffle and must collect an ancient series of armor to stand a chance against the ultra powerful Dark Knight. The second and third books are side stories that take place during Ogden's adventures. One deals with the prince of Westeria, entering an ice dungeon where his father had passed. Here, he journeys to acquire a story-related object. The second concerns a thief alongside a trusty niece with the aim of leaving their current abode for sunnier pastures. Book four takes place in another timeline altogether with a completely unrelated story to the other events of Dragon Fantasy, having the hero save Minecraft creator Notch's hat from a savage dragon. Should have stayed in retirement, Ogden! The stories have a charm to them in both their dialogue and their script in general. The humor is really good, featuring a lot of tongue in cheek stuff, especially in battle. 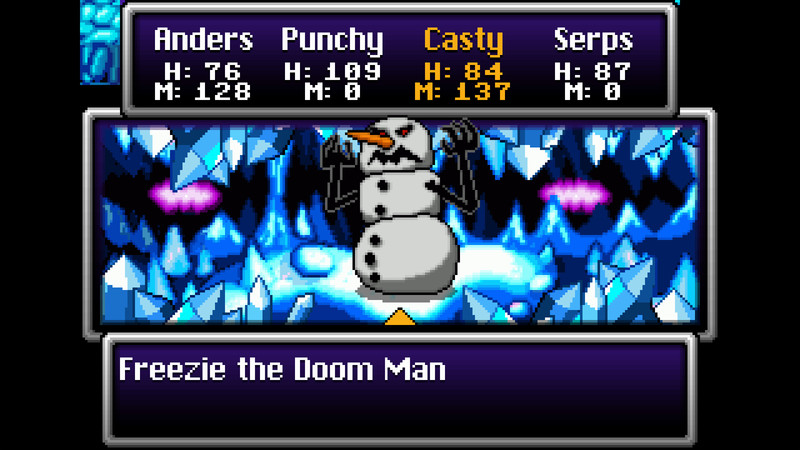 I mean, what else can you say about facing enemies like The Hunka Burning Love, a fiery cloud monster, or a son of a rock monster who sports a green mohawk and attacks with things like yelling statements that say "You're not the boss of me!" Something a rebellious rock creature would definitely do-- at least with my experience with rock monsters. This snowman is definitely not a jolly happy soul! All of the Dragon Fantasy books require a good deal of grinding, whether if it's experience to gain levels and new spells or money to purchase new equipment. It doesn't help that when you die you lose a good portion of your money, so keeping your health at a high amount is recommended, especially for battles where an enemy attacks before your character does each turn. Grinding isn't so bad as levels are earned relatively quickly and enemies divulge a respectable amount of experience each battle, and while the script is indeed sharp, seeing "the Obligatory Ork feels the need to attack" for the thirtieth time in battle can get a bit old. Dragon Fantasy: The Volumes of Westeria has seen a lot of improvements compared to its separate releases several years ago. For one, players have access to a quest log to keep tabs of their adventure, as well as an in-game map to better get a grasp on the world, towns, and dungeons that they travel through. The individual books only allowed players to purchase one item at a time, meaning that for big spending on things like a dozen health-restoring Herbs, this process took a while. This design flaw has been corrected with the Wii U and 3DS eShop releases, allowing multiple volumes of items to be purchased at once. Additionally, the ability to sort through Ogden's (or whichever character's) inventory and through shop's wares have also been included, making for an easier time overall. ghouls, wereman, and rock monsters to explore this town. That's not the end of the improvements either. in Book I, Ogden has the capability of adding different monsters as allies to his party. No longer will our hero have to travel through the game alone and grind all by his lonesome. 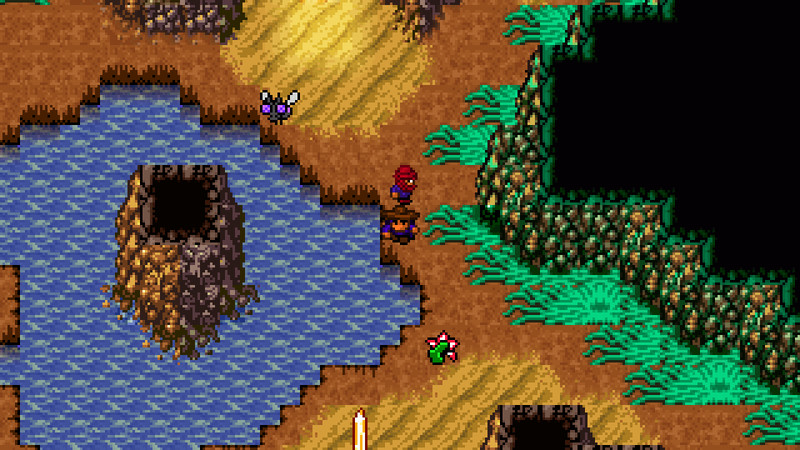 Finally, while the world map continues to have random encounters, battles indoors are initiated by touching roaming enemy sprites. 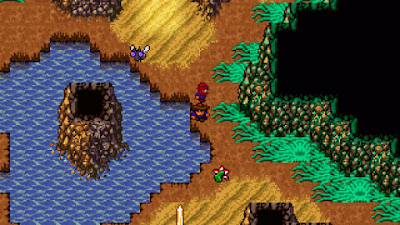 Each time Ogden moves, the enemy sprites on the dungeon map move simultaneously. This assists players in either avoiding battle or cornering a foe. No more random encounters while exploring the already dangerous dungeons within Dragon Fantasy. Enemy encounters indoors have been changed for the better. Muteki Corporation, the developer behind Dragon Fantasy's various books, has certainly been faithful to the NES-style RPGs that the game is modeled after. 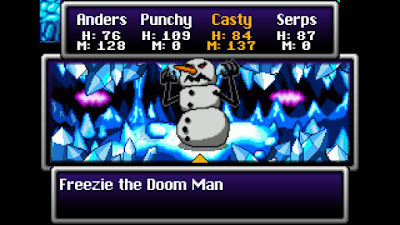 Enemies show simplistic sprites, backgrounds are 8-bit in appearance, the aforementioned grinding is here, and the basic story is present and accounted for. The visuals are most impressive in battle and on the world map where the 3D effect of the Nintendo 3DS version is most prominent, but the music leaves something to be desired. It's by no means bad, but it loops quickly and is a bit forgettable overall. And I'm missing that for saving the world?! Dragon Fantasy: The Volumes of Westeria delivers unto players a nostalgic trip back into time where RPGs were of a simpler nature, grinding was a necessary evil, and the sophistication of story wasn't as large. If you yearn for constant battle after battle against monster after monster, burning through MP and items healing yourself after most encounters, and a nice throwback to early RPGs as found on the old Nintendo Entertainment System, then you'll find yourself at home with Dragon Fantasy. All others may find the game to be too old school for its own. For me, the game was just the right amount of old and new to make it worthwhile. Review copy provided by Choice Provisions.